GMC's Sierra and upline Sierra Denali pickups bolster body/payload/powertain options with a dash of style. They'll be all new for 2014. The 2013 gmc sierra 1500 extended cab electric vehicle qualifies for a federal tax credit of up to $7,500, effectively reducing the net base price. On the surface, GMC’s Sierra half-ton pickup for 2013 may look like a Chevy Silverado clone, but dig a little deeper and you’ll find some subtle and some not-so-subtle differences. The Sierra’s engines, transmissions and body configurations are the same, as are the specifications for power, fuel economy and towing. But the 2013 GMC Sierra displays a more professional appearance, with copious amounts of chrome in the grille and more stylish wheel options. There’s also the Denali trim that elevates the Sierra to near-Cadillac status. Of course, the 2013 GMC Sierra is still a work truck and so it is equipped with a number of helpful workplace features and options. There is even a Hybrid model, something no other manufacturer outside of GM offers. If your towing needs run in the 7,000-10,000 pound range, a compact pickup isn’t going to cut it; the full-size 2013 GMC Sierra, on the other hand, will. Models range from a basic Work Truck to the frugal 23-mpg Sierra Hybrid to the luxurious Denali. If your truck needs revolve around light towing and recreational outings, a smaller mid-size or compact pickup might be more desirable. Not only will you save money at the pump, the sticker price is likely to be lower as well. Changes to the 2013 GMC Sierra half-ton are limited to two new exterior colors and the addition of powertrain grade-braking that uses transmission downshifting to ease stress and temperature build-up on the brake rotors. 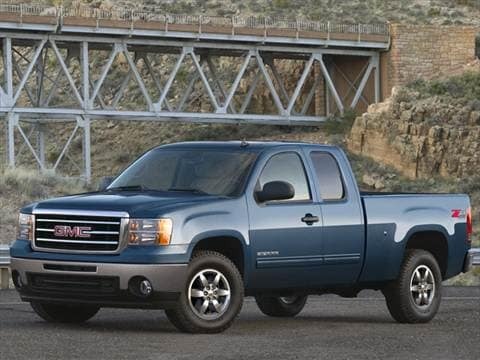 Ample power and a civilized ride are two of the 2013 GMC Sierra’s most welcome attributes. The Sierra’s rigid chassis and tight panel fitment are made possible by the fully-boxed ladder frame, while the coil-over-shock front suspension and rack-and-pinion steering provide a level of control uncommon in such a high-center-of-gravity vehicle. Our time in the Sierra covered a number of road surfaces and conditions. Even over the roughest surfaces, the half-ton Sierra’s cabin remained calm, bothered neither by noise or vibration. As for engine choices, we think the 4.3-liter V6 is adequate for most light jobs, but we prefer the pulling and passing power provided by the 5.3-liter V8. The ultimate power play belongs to the Denali, which has a 403-horsepower 6.2-liter V8. All of the Sierra’s V8 engines can run on E85, and the 5.3-liter V8 includes Active Fuel Management cylinder deactivation technology for maximum fuel efficiency. Standard on the Denali and available on SLT trims, these seats almost guarantee to keep the front occupants cozy in winter and summer. The Active Fuel Management system available on the 5.3-liter V8s cuts the operation of four cylinders when they are unneeded and thus enhances fuel economy. For 2013, the GMC Sierra pickup offers two distinct interiors aimed at satisfying two distinctly different customers. On WT, SL and SLE trims, GMC’s “pure pickup” interior theme includes more use of vinyl on the floor coverings, as well as larger door handles and instrument-panel knobs. Moving to the SLT and Denali trims brings the same upscale interior found on the GMC Yukon, providing plenty of soft-touch surfaces, wood-grain trim and, on Denali models, a heated steering wheel. Crew Cab models feature a 60/40-split rear seat with a fold-up seat bottom that creates a large, uninterrupted load floor. The 2013 GMC Sierra distinguishes itself from its Chevrolet cousin with a bold 4-bar grille design, more expressive front and rear fender flares and more stylish 20-inch alloy wheels. The GMC Sierra features a large box area with high walls to maximize cargo capacity, although this same design can make it difficult to reach the center of the bed, as is required when accessing a bed-mounted tool box. Another feature we like are the Extended Cab’s rear access doors that swing out 170 degrees, making it easy to load people or items into the rear of the cab. GMC’s 2013 Sierra 1500 comes in seven trim levels, from basic to sinfully luxurious. Cloth seats are standard on WT, SE and SLE models, and leather seating is available on SLE models. The Denali is a distinct model unto itself and includes as standard a 6.2-liter V8 engine. SLT models include standard leather seats, the "luxury" instrument panel, 12-way power-adjustable driver's seat, Bose speakers and Bluetooth. The crew-cab SLT version is even more luxurious with rain-sensing windshield wipers and a rear-seat audio system. Even the base trim level includes cruise control, air conditioning, XM Satellite radio and side-impact and head-curtain airbags. Convenience features offered on SLE and SLT models include touch-screen navigation/sound system, power-operated moonroof, rear backup camera and a power-sliding rear window. The Denali trim offers heated and cooled front seats, a heated steering wheel and rear backup camera as standard. The 2013 GMC Sierra offers five distinct suspension systems, each tailored to suit specific driving requirements. They include Z83 for a solid, smooth ride; Z85 for enhanced handling and trailer towing; Z71 for enhanced off-road capability; Z60 for street performance with 20-inch wheels; and NHT for maximum towing capacity. While we expect the 4.3-liter V6 and 4.8-liter V8 to be more than adequate in Work Truck applications, we recommend the 5.3-liter V8 engines, most with cast-iron blocks and some with aluminum, but all with Active Fuel Management and variable valve timing. And for those who want more power or towing capacity, the 6.2-liter V8, available only on the Denali trim level, is tops in its class, offering significantly more power and torque with very little penalty in fuel economy. The 2013 Sierra Hybrid truck features a 6.0-liter Vortec V8 with an electric motor/generator built into the transmission. The two-mode system employs two 60-kilowatt electric motors that can power the truck on pure electric at low speeds or assist the gasoline engine at higher speeds. The 2013 GMC Sierra 1500's starting Manufacturer's Suggested Retail Price (MSRP) of around $23,500 delivers a capable but plain Work Truck. The SLE trim level with substantial equipment starts closer to $30,000. The SLT Extended Cab model begins at an MSRP close to $37,000, and a fully-loaded all-wheel-drive Denali approaches the $55,000 mark. Be sure to check the Incentives tab to see what savings may be on the table. We advise that you check the kbb.com Fair Purchase Price to see what consumers are paying in your area. The Sierra offers good projected resale values for its segment, higher than those for the Ram 1500, on par with those of the Nissan Titan, but below those of the Ford F-150 and Toyota Tundra. Excellent truck! Drives like a dream!